Don’t let the ominous perception of “aging” - a lack of purpose, feeling irrelevant and under-used, having nothing to do - take control of you and your life. Renowned psychotherapist and aging expert Andrea Brandt, Ph.D., MFT, helps you throw out the old stereotypes about getting older and move toward the welcoming new evidence that your future is alive with possibility, providing steps to thrive today and into your golden years. Join the millions who are becoming mindful about aging, and discover the secrets to creating a life that doesn’t wane as the years go by. Mindful Aging will forever change how you view-and embrace-your life as you age. Andrea Brandt, PhD, MFT, has over 35 years of clinical experience as a renowned psychotherapist, speaker, and author. In her work, Dr. Brandt reveals positive paths to emotional health that teach you how to reinvent and empower yourself. She emphasizes the mind–body–heart connection as a key to mental, physical, and emotional wellness. A featured media expert, Dr. Brandt has appeared on numerous television programs, radio shows, and podcasts. She is a contributor to Psychology Today magazine and has written blog posts for The Huffington Post, Mind Body Green, Psych Central, and more. Dr. Brandt is the author of 8 Keys to Eliminating Passive-Aggressiveness and Mindful Anger: A Pathway to Emotional Freedom. "If you're concerned about growing older, don't be. Andrea Brandt not only lays our concerns to rest about what awaits us as we age, she demonstrates how growing older can be the most fulfilling experience of our entire life." "I used to worry that I would have to go back to school to learn how to age gracefully, but Mindful Aging has taught me all I need to know! It's a much-needed book and an empowering read that encourages reflection, self-discovery and personal change during a most precious time of life." "It's never too late to enjoy the rest of your life. With a learned approach to lifespan development, Dr. Andrea Brandt takes a wise and sensitive look at the process of mindful aging and concludes that while THE body must age, the mind can soar. 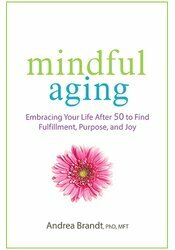 Mindful Aging is inspirational and an insightful guide for all. A must read!" "Age and experience can be assets, rather than detriments, to living a happy, healthy, and empowered life. That's just one of the many uplifting messages Dr. Andrea Brandt writes about in this thought-provoking book, which is equipped with wisdom and a myriad of other inner resources that can only be developed with age. We are finally in our prime, uniquely ready to make our most significant mark on the world. Mindful Aging inspires and guides us to embrace the opportunities of our older years and to engage in what matters most." "This timely and inspiring guide to aging with joy and renewal takes on special meaning as globalization and technological change in the 21st century beckons us to foster resilience and embrace life-long learning with pleasure, growth and fuller self-expression. Andrea Brandt's encouraging and informative work is long over-due." "Beautifully written and providing a powerful mix of science, real-life examples, and heartfelt encouragement, this book offers the recipe for living our very best life after middle age." "Thoroughly enjoyed reading this book. It poetically puts to paper concrete ideas and strategies for how to create a life worth living as a senior. I will refer to it again and again for myself and my clients." "Mindful Aging offers a remarkable and optimistic strategy for the challenges and adventure of living as we grow older. It deserves a place on every bookshelf as a hopeful reminder of what is real and what is possible." "This is not just another 'feel-good' book. Brandt's clinical experience comes through as she explains clearly how to craft a life marked by health, purpose, creativity, and passion and offers exercises to bring it to life, literally." "Mindful Aging is an inspiring road map toward self-fulfillment in the 'golden years' of life. Dr. Andrea Brandt has captured a vision and spirit of hopefulness for all of us and her exercises motivate us to engage in this wonderful process of aging. A must-read book for all!"